Eddie Redmayne playing cosmologist Stephen Hawking in "The Theory of Everything." 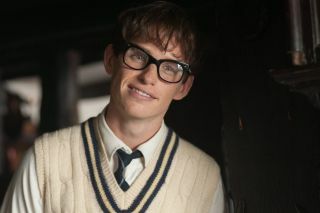 Redmayne won a 2015 Golden Globe for his role as Hawking. The Stephen Hawking biopic "The Theory of Everything" took home two Golden Globe awards during the Sunday night (Jan. 11) ceremony. Actor Eddie Redmayne won the "Best Actor in a Motion Picture, Drama" award for his critically acclaimed portrayal of famed astrophysicist Hawking, who is now 72. Composer Jóhann Jóhannsson won in the "Best Original Score" category for his work on "The Theory of Everything." In total, "The Theory of Everything" was nominated for prizes in four different categories Sunday (Jan. 11). "This was a huge privilege. Stephen, Jane, Jonathan and the Hawking family allowed us into their lives and entrusted us with their story," Redmayne said during his acceptance speech. "And getting to spend time with Stephen Hawking — who, despite all of the obstacles put in his way, has lived passionately and fully and with great humor — was one of the great, great honors of my life."